In my circle of Latin friends and family, I have been mocked a little for my crunchiness: using a Midwife, insisting on breastfeeding despite less-than-perfect circumstances and even our use of cloth napkins. Soy un poco ridicula, they have said. But, among members of my mom’s group in Nashville — co-sleepers, Diva Cup-wearers, CSA members — I’m just a run-of-the-mill chick. It’s all about perspective and the lessons for me in this dual identity is that there’s always somebody more crunchy, and less crunchy, than thou. I don’t see any of these things we do as crunchy, by the way. Just common sense and a consideration for our health and our environment. So, when my daughter was a toddler I tossed the rubber duck she liked to chew on because I suspected it was toxic. 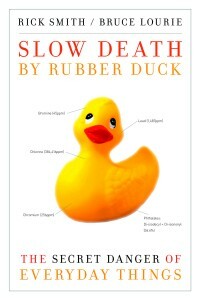 So, imagine what I thought when I received a book for review titled: Slow Death by Rubber Duck? The subtitle: The Secret Dangers of Everyday Things. The book has just been released in the U.S. Between the covers, I didn’t discover so much that I already didn’t know, or suspect. When I was pregnant, I loved the book Having Faith, which gives details about chemicals — like flame-retardant — that have invaded our bodies and our breastmilk. Authors Smith and Lourie, both well-known Canadian environmentalists, conducted a non-scientific experiment they documented in the book. They locked themselves in a condo and used popular perfumed, chemical-laden everyday and common products. They microwaved food in plastic, sat on couches that had been sprayed with retardant and ate lots of tuna out of cans. Their blood levels for most of the toxic chemicals in our environment went up. And the sad truth is, we as consumers would have a hard time avoiding most of the chemicals. Our food is processed and packaged in plastic, we like the ease of cooking on non-stick surfaces, we love the plastic shower curtain that can be tossed and cheaply replaced. And, seriously, personally can’t quite yet give up my bleach sink cleaner and the occasional use of pine-scented cleanser, which brings me joy joy memories of growing up cubanita. Progress, not perfection. You can hear them next week on the Diane Rehm show and google them for other interviews and videos on YouTube. The tough choices we face as consumers was highlighted in a passage that described the quandary one of the authors faced while buying ketchup: buy the organic in plastic, buy the local product that also came in plastic, or buy the non-organic international name brand packaged in the glass jar? If you’re feeling your way through these issues about health, consumerism, green living and modern choices, grab this book. It will give you a better understanding, and a vocabulary, about the challenges we face as consumers who want products for ourselves and our children that will not potentially cause health problems — everything from cancers to diabetes to impaired brain function. Here’s a more detailed overview by chapter and if you don’t fee like getting a book, read these great Green blogs like the Smart Mama and Organic Mania. Eat organic food, free of pesticides, which can cause cancer, impair immune and damage reproductive systems. Avoid phthalates (tha-lates) which are found in PVC plastic and personal care items. The chemical makes plastic pliable and often is found in artificial fragrances. They mimic hormones and some scientists believe it is one reason why girls are menstruating at younger ages and linked to reproductive problems in men. Replace non-stick pans with stainless steel or iron and say no to microwave popcorn, which are covered in perfluorinated chemicals (PFCs). They are linked to cancer and can be found in everything from furniture, clothing, carpets and fast food wrappers. Grow your own vegetables and herbs to avoid pesticides. Avoid flame retardants (polybrominated diphenyl ethers (PBDEs), which are found in furniture, mattresses, curtains, carpets and electronics. Instead use natural fibers such as wool, hemp, and cotton. Eat fish in moderation to reduce exposure to mercury, a neurotoxin that harms the development of children. If you are pregnant or planning to become pregnant avoid all tuna, shark and swordfish. Smaller fish are safer than large fish. Chuck the antibacterial soap, especially those with triclosan, which weakens the immune system and is suspected of causing cancer. Get rid of anything in your house with BPA, or bisphenol A. The chemical found in plastics mimics estrogen and is linked to diseases such as breast cancer and diabetes. it is often found in plastic containers, baby bottles, reusable sports bottles and food can linings. Choose glass, non BPA plastics and pick fresh or frozen foods when possible. Household cleansers often have chemicals in them that are unlabeled. Instead using harsh detergents try safer and cheaper alternatives such as baking soda, vinegar, vegetable oil and lemon juice. So, que dices tu, what are you doing to clean up the chemicals in your life? You are so right about the whole perspective thing. It all depends on who you talk to. Having adopted as full as I possibly can at this point natural lifestyle, I no longer today worry what anyone else thinks of it, even if some people think it is “extreme”. To me it is not extreme at all, but a smart way to get pro-active about one’s health. So I applaud you too for the choices you are making! They will go a long way for you and your family, especially that you have a new life that you are bringing into this world. I am glad you liked the book. I definitely recommend it for everyone who is interested at least a bit in their health or curious about how much of an impact our chemical world really has on us. And thank you for the link. don’t forget flame retardant children’s sleepwear. as long as the child is in close-fitting 100% cotton, flame retardant is not required by law. not to even mention how icky flame retardant polyester is. Ay, this is such a huge, huge topic! I laughed reading your first paragraph because I was definitely la loca in my family for having nursed my girl for a year, co-slept for 6 months and attempted to cloth diaper her (that didn´t last long), amongst many, many other “hippie Californian” decisions I continue to make. Funny thing, is I became obsessed with vegetarianism, organics, toxins, an alternative lifestyle, etc years ago when I lived in Mexico. Evita, I love your site. Thank you for the comment. Ro, great reminder. I didn’t get all that until Maria was a toddler. And, Ana…this is why I love you! Somos iguales. Enjoy the book. It is eye-opening! I am reading the book at the moment and couldn’t believe the microwave popcorn! We eat it weekly! Marcela, yup, the microwave popcorn freaked me out too. I don’t eat it much, but keep it around for quickie snacks and I do love it too. Nice to meet another crunchy mami! We need to stick together.